There is an increasing demand from larger corporate clients who buy large volumes of business gifts and commercial merchandise for interfaces with their in-house procurement systems such as Ariba, SAP and Perfect Commerce. c)Round Trip includes a credential pass from Intranet to STORE Enterprise, then a punchout from QOP back to Intranet and finally, an update of STORE Enterprise Shopping Basket with Purchase Order Number from Intranet system. At this point the order will download from the STORE Enterprise website into the distributors PromoServe system. A live, interactive catalogue hosted on a website (such as STORE Enterprise) (this is different from a static catalogue which is normally uploaded directly into your suppliers procurement system). It is simply a .txt file of data to be passed between systems cXML, product information is described with tags and attributes using a syntax similar to HTML. Recommended format for website integration. 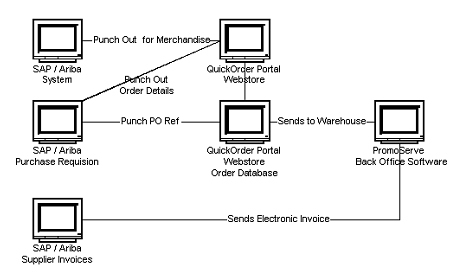 These can be used on any STORE Enterprise eCommerce enabled website (for a one off fee, variable dependant on purchasing system used) and enable your customer to click a link to 'PunchOut' button from the shopping basket this returns the order information to the suppliers procurement application. The products and their prices then appear within the procurement application on a purchase requisition. When your customers click on this button their web browser logs them into STORE Enterprise so they can browse product options, specify configurations, and select delivery methods. In order for PromoServe Business Systems to collate the correct information for a Punchout, the following details are required initially. 7) Establish what fields are passed during the Credential Pass eg. Username/Password examples. 8) When the STORE Enterprise website is accessed, what expectations are there in relation to the information that is punched back to the Intranet system, eg Product, Delivery. 9) This is an important stage - when the order/product details are punched back into the Intranet system establish what control is available to the end user eg. 12) If a 'Round Trip' takes place - answers to question 9 need to be carefully considered. At this stage a new order is created in STORE Enterprise and downloaded into PromoServe. Finally, timescales should be considered, Punchouts require bespoke programming and thorough testing, therefore a time scale of at least 8 weeks should be allocated.